After getting a preview post by Mikatan a few days ago, Nendoroid Petite: IDOLM@STER Cinderella Girls – Stage 01 has gone available for pre-order today. 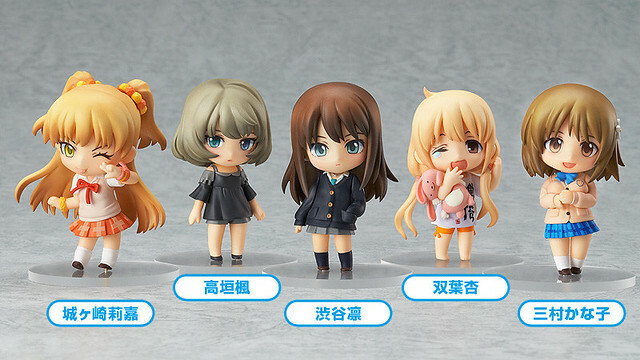 From the popular social game, ‘IDOLM@STER Cinderella Girls’ comes a collection of Nendoroid Petite figures featuring five different characters from the game – Rin Shibuya, Anzu Futaba, Kanako Mimura, Kaede Takagaki and Rika Jougasaki. The characters are wearing their ‘Normal’ or ‘Rare’ outfits from the game, all sculpted down to cute Nendoroid Petite size! There are also two secret characters that are dressed up are in their ‘Plus+’ outfits from the game, creating a total of seven different figure to collect! This Petite set is available for 500 Yen each, or 4000 Yen for a box of 8 Petites, which consists of 5 main characters + 2 secret characters + 1 duplicate character. The set is scheduled for May 2013 release. The Petite set will also be available for pre-order at the GOOD SMILE ONLINE SHOP between December 4th, 2012 (Tue) from 12:00 until January 9th, 2013 (Wed) at 21:00.